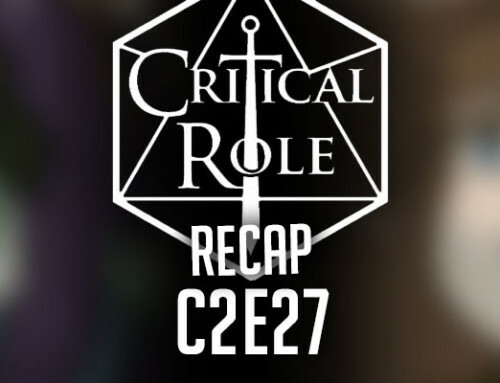 Spoilers for Critical Role Campaign 2 Episode 20 (obviously). 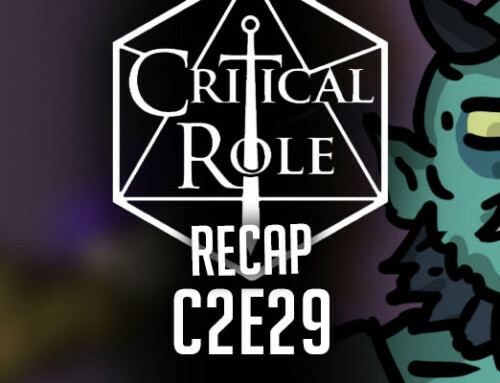 Check out the recap for Campaign 2 Episode 19 here. The Mighty Nein continue to Labenda. After spending a few days in Zadash, they left right as war broke out. They left a few opportunities in the city in order to pursue work with The Gentleman elsewhere. They made their way northward, seeking the swamp. They met a few enemies during the previous rainy night, but manage to defeat them. The misty, gray morning emerges from the rainy night. They wake up with their teeth chattering, shivering. Jester, the only one not cold, happily crunches through the frost. They take swigs from Nott’s magical flask and wonder how much of it is full all the time. 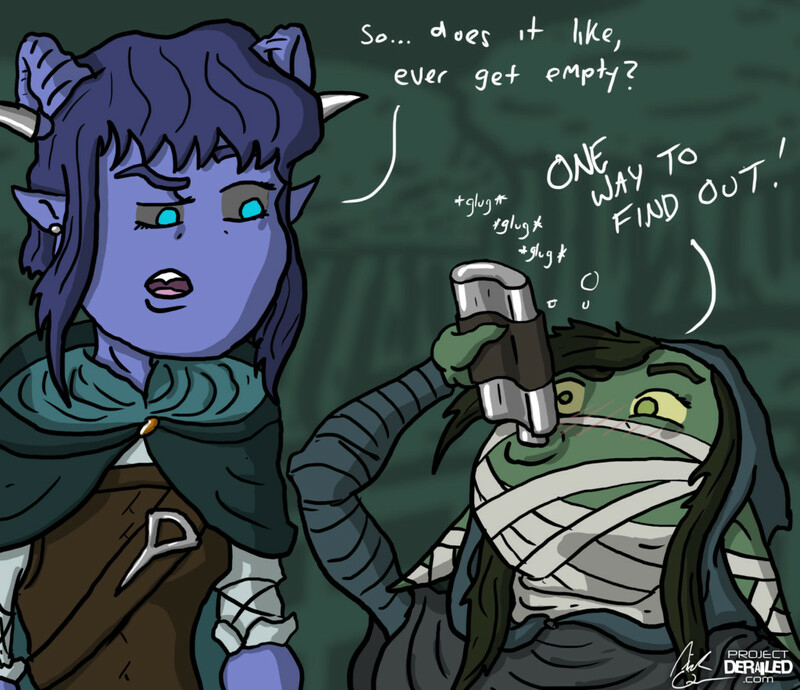 Nott drinks as much as she can from the flask. Caleb takes the flask from her and shakes it. It seems about half empty. Jester makes Nott throw up. Caleb ignores this and takes a look at his map. He guesses that they can get to their next stop by sunset. However, they elect to go a bit slower and rest for the night along the way. They saddle up their horses and head on their way. Molly drives the horses while Jester stands in the cart, keeping watch. She holds onto his horns for stability. For the first half of the day, they travel without major issues. A bit of sunlight breaks through the clouds. As they go, Beau spots a dark shape come over the rolling hilltops. They squint into the distance, trying to see if it’s just a cloud or something more sinister. As they watch, Caleb realizes that this is a legion of soldiers. They decide to move faster, not wanting to interact with the soldiers. As they rush, they reach a turn, and the horses start to veer off. One of the wheels sinks into the embankment and grinds the caravan to a halt. They quickly look through their things to see if they can fix and dislodge the cart. Jester uses her mending cantrip. The wheel magically rights itself and bends back into place. The second damaged wheel is too damaged for the spell. Five horses approach. The riders wear Righteous Brand armor. They quickly hide their safe. The soldiers approach and apologize for blocking the road. 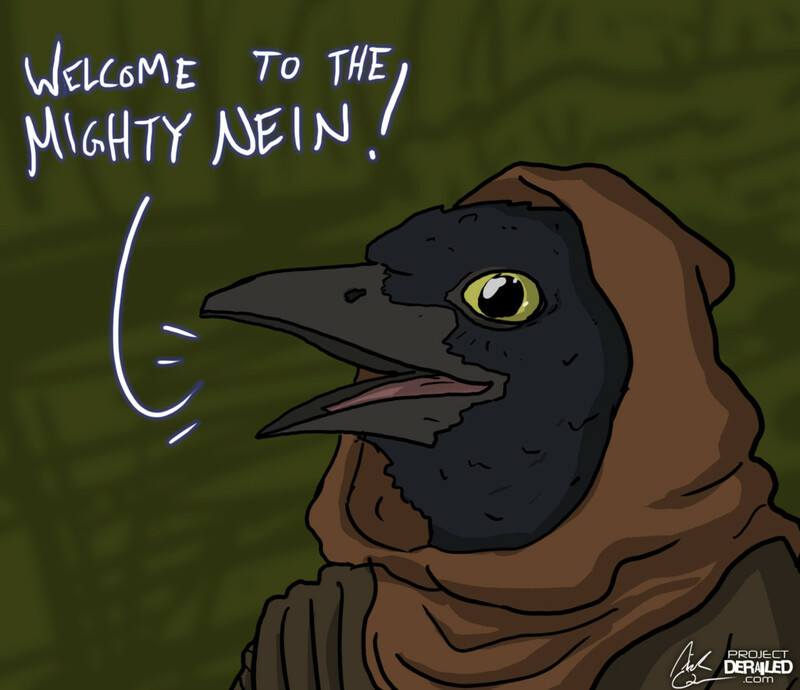 The Mighty Nein ask if they can assist them in fixing their cart. The soldiers agree. 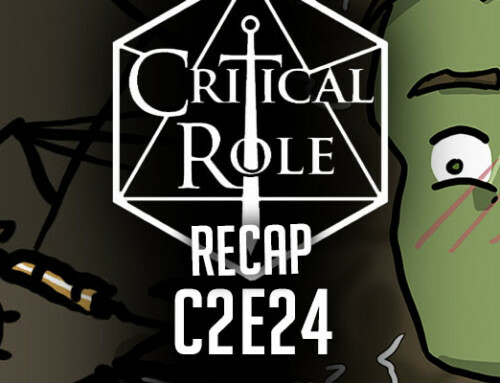 While the soldiers are distracted, Nott steals a pouch of dried oats and corn from them. They ask one of the soldiers about their next destination: Labenda. She explains that it’s one of the oldest settlements in the empire and not very nice. They ask her if she would rather be there or where she’s going. She responds that, in times of war, they do what they must. With Jester’s help, they dislodge the cart and fix the broken wheel and wood. The captain tells them that he hopes they will be safe and that their paths will cross again. He rides away with the passing legion. Jester uses mending on the remaining broken pieces of the cart, fixing it. They get back on the road, still heading north. As they go, Beau asks Fjord if his dreams are affected by the weather. She asks if he throws up ice or other things when the weather changes. He says that it’s only happened once, but if that changes, he’ll tell them. They find an old campsite and set up camp. Molly and Fjord take the first watch. During his watch, he sees a flash in the distance. He realizes that a thunderstorm is approaching. In the distance, he also sees a mountain range he hasn’t noticed before. As the storm approaches, it wakes the others. A few of them go under the cart as the rain extinguishes the fire and soaks the ground and their things. Yasha is lulled to sleep by the thunder and rain. She finds herself in a dream. There’s lightning and thunder. A memory. The people she knows surround her, though they are turned away. Another flash. Elevated ground with a rock, obscured by the low light. She knows the shape. Darkness that lingers. A searing pain in her arms. Dull bluish purple flames climb down her arms to her fingers. Another flash. Bodies of creatures, people, children, monsters. Blood drips down her arms. Another flash. A ruined statue, and the land rejecting what the statue represents. Her eyes focus on a disc and four bolts of lightning. Darkness. Another flash, and she’s walking. She’s thirsty and her muscles ache. She looks over her shoulder to see the central swamp of Xhorhas. It’s crawling with thousands of huge worms. in front of her is a mountain. She pushes onward, darkness coming once again. Confusion and desperation takes her mind. What can she make right? What is there? A final loud, shaking flash of lightning and rolling thunder. In front of her, a figure in a dark storm cloud. Her hair whips around her. The same figure as the statue. It pulled her from the darkness once before. She sees it’s muscular form and grey flesh. It steps down like a titan from the sky. The ground shakes, but she feels comfort. A voice comes into her head. She wakes up, and she is back with The Mighty Nein in the wet grass. Nott goes over to Yasha. She asks if Yasha’s wings can protect her from the rain. Yasha says they can’t be out for very long. She holds her arm over the goblin instead. 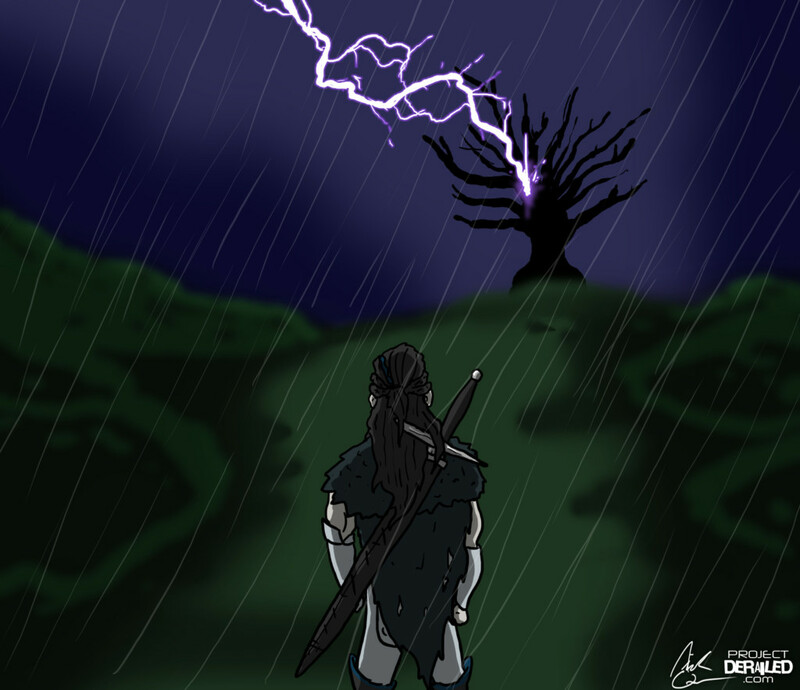 She tells Nott that she has to take a walk and approaches a tree struck by lightning. She sees that the tree has been split in half. In the center are orange still-glowing embers. She uses her sword to carve the symbol of the storm lord into the tree. She grabs a bit of bark as well. She heads back to Nott. She shows Nott the bark. Nott asks if she collects things as well. Yasha says that she does and pulls out her book. In the pages are small mementos from her journey. Nott asks if it’s for a special someone. Yasha says that it is. Nott lists a bunch of items she collects including buttons and soles of shoes (but not the shoes themselves). After talking a bit more, Nott cuddles back into Yasha to protect herself from the rain. 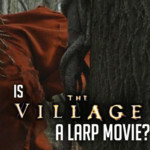 When they wake up in the morning, the group learns that Yasha took some bark. They all excitedly say they want some as well. Caleb tells the others that soon, he will be able to create a magical shelter to protect them from the rain. Fjord suggests that moving faster will get them warmer. Beau starts doing push ups while Molly goes to examine the tree. Caleb sees Beau do pushups and tries to do one as well. He completes one before switching tasks. Jester announces to the group that she wants to ride on a horse. As they ride, Nott successfully makes acid in the back of the cart. They travel for most of the morning, and they watch as grass gives way to moistened terrain. The ground begins to get swampy, though the road mostly holds together. Molly uses his sword to scrape off mud as they go. The rain eventually subsides, and they see the foliage and insects of the swamp. Beau pokes her staff into the marsh. It depresses the ground and water fills into the hole. After another half hour, Beau, Caleb, Molly, and Jester hear a trill cry. They wonder if it was a bird, talking, or an alert. Jester caws back at it. The cawing becomes more frantic, but they can’t tell from where the noise is coming. Something shifts in the water. They hear the cawing again. Jester climbs a nearby tree. Past the treeline, she sees a small clearing. A tree has fallen, and something struggles in the center of the bog, covered in tar-like liquid. A small feathered creature struggles. A reptilian creature slowly swims towards the bird creature. Jester quickly casts guiding bolt on the reptilian creature. The bolt lands and the reptilian creature cries out and looks for what hit it. Jester yells to the others that they have to help and runs towards the bird creature. The others, left with little option, follow. Jester climbs up onto a log to get out of the swamp. She summons her spiritual weapon. Caleb casts haste on Nott. She rushes forward. The gator approaches the bird creature. From the other side, another emerges. They snap their jaws at it and swing their tails at the small creature. Molly casts enthrall on one of the gators. The creature falls under the effects of the spell and becomes completely distracted by Molly. Beau throws her throwing stars at the gators. Jester uses her spiritual weapon to hit one of the gators. Yasha goes into a rage. Caleb puts on his glove and shoots flames at the alligators. The flames land, hitting the creatures. Nott shoots her crossbow. It hits the gator who has been blinded and enthralled by Mollymauk. One of the gators comes over and bites Nott. The other bites Yasha. Fjord casts eldritch blast on the gator holding Nott. His two bolts hit. Beau also goes for the gator biting Nott. Many of her attacks miss, but one lands. Molly casts vicious mockery on the one with Nott, but the spell is unsuccessful. Jester casts healing word on the bird creature. It’s eye opens and tries to pull back out of the bog. Yasha swings at the gator biting her. She pulls its jaws apart, freeing herself before using her sword to slice its throat. Caleb casts five magic missiles on the remaining gator. During this, Nott manages to slip out. She fires her crossbow at the gator. Her bolts land, and she tries to run away. The gator, however, bites at her again, and grapples her once more. Beau sees this attack on Nott and cracks her quarterstaff across its snout. The gator knocks Nott out. However, the haste spell knocks out of the beast’s jaws and free from its bites. 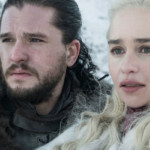 Fjord rushes over to the unconscious Nott to protect her. Fjord lets loose two eldritch blasts. They burst through its skull and exit the back of its head. They quickly wake Nott up and rush over to the struggling bird creature. The creature looks to be about the size of an eight year old human child. Instead of skin, the creature is covered in black feathers, but it has no wings. It has a long, black pointed beak that is still crying out. 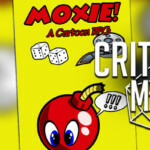 Jester pulls the creature out of the bog. The creature begins to shake the thick tar off. Jester asks the kenku if she can understand them, and she nods her head. Jester asks for her name, but she doesn’t respond. She asks for if she is an adult or kid, and she responds that she is a kid. She indicates that she lives far away to the east. The kenku starts going for Caleb’s books, but he pulls them away. Instead, Jester hands the kenku her journal. She writes in it, thanking them and revealing that her name is Kiri. Kiri also writes that she is four years old. She says that she and her family have traveled a long way, but lost each other along the way. The swamp folk spotted them, and she fell into the bog. The family couldn’t stop and risk everyone for her, so they moved on. Caleb explains to the others that Kiri is a kenku. She writes in the book, asking to come with them. Jester asks Nott how old she is. Nott happily announces that she’s at least twice Kiri’s age. Jester wonders if Kenku four is different from human four. Caleb asks if she’s able to handle herself in danger. She looks back at the bog and hunkers down. Fjord gives her a dagger and they agree to house her temporarily. Nott offers her some of the dried oats and corn she stole earlier. Jester gives her some pastries as well. Beau tries to test Kiri’s fighting skills. She lands a solid punch to Beau’s hand, but even her strongest isn’t terribly forceful. They carve through the gators to see what’s in their stomachs. They save the skins to trade later. In the stomachs, they see kenku bones. They guess that the bones belong to three of Kiri’s sisters. Caleb leads Kiri away when he realizes what’s in the stomachs. He casts comprehend languages and asks Kiri if there’s anything in particular she wants them to know. She says that she just wants to get back to their family. Kiri goes back and helps Jester bring the leather to the cart, repeating what she says. She goes up to Nott, who she is eye-level with, and looks at her curiously. Nott gives her a kiss on the beak, which startles her. Caleb poofs Frumpkin into Kiri’s hands. She bleps and nuzzles into her. Kiri, overwhelmed, drops Frumpkin, who immediately wraps around her legs. Caleb explains that Frumpkin is very friendly. She picks Frumpkin up again and rushes to the cart. She turns back to them and repeats Nott’s words from earlier. Caleb points out that they only need one more member for there to be nine of them. Beau says she likes the name being cheeky. Jester says that they should get Kiri a cloak so she looks less obviously like a bird. Nott gives Kiri her cloak. Jester gives Nott her cloak. Caleb gives Jester his cloak, but she turns it down. They get back on the road and head out. They see the distant glow of lanterns as the sun sets. As they approach, they see that half of the town is sunken. Jester goes up to a woman on the street and asks for a tavern. The woman gives Jester directions. Beau gives her some pocket bacon as payment. They pass through the poor sections of the city looking through the tavern. Moss and water has permeated the buildings. Beau approaches a nearby guard. After harassing him about his life, she discovers that his name is crownsguard Alexander and that he doesn’t like her. They do a standoff, seeing who will walk away first. The guard loses, and Beau walks away victorious. Beau comes back to the group debating if they should let Nott give Kiri booze from her flask. They ultimately decide to wait. They enter the tavern. The interior looks like the interior of a ship. Fjord is instantly at home. Behind the bar is a middle age male gnome. He calls out to them and welcomes to the Keystone Pub. He says it’s the oldest pub, but corrects himself and says it was rebuilt on top of the oldest pub. He introduces himself as Dent Bonswallow. He tells them a bit about the history of the tavern, and charges them for their rooms. Jester decides to put their cart and horses in the stable on her own. Beau asks about Fabron Keyes. Dent points them to him. He is currently asleep in a chair. Molly walks over and wakes him up. Fabron reacts to this angrily. Molly says that he seems like an interesting gentlemen. He says that he wants nothing to do with The Gentleman. They offer to either bring him back to The Gentleman or to simply show them what’s going on. Fabron begins to get nervous. He says that they have no idea what’s out there. He says that his job was simply supposed to be leading people to the safehouse. However, a few weeks ago, he returned to hear low, echoing howls coming from the safehouse. Outside of the house, all of the occupants were dead. He says that 100 gold pieces and a drink will convince him to take them there. He haggles with Jester. They agree to pay 100 gold for him to lead them to the safehouse and a song. The barkeeper leads them to their rooms. There is one bed per room. 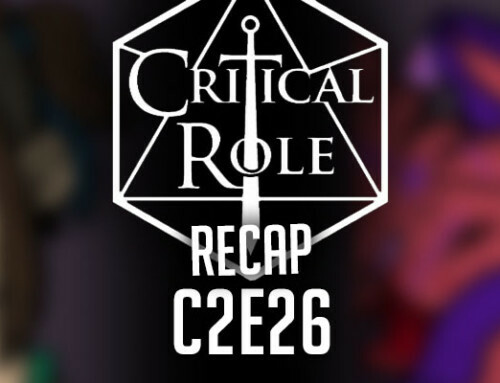 They decide to have Beau, Jester, and Kiri in one room, Fjord and Molly in another, Caleb and Nott in their own, and Yasha with Fabron. She demands the bed, and, after some argument, he complies. She keeps the lights on all night. Caleb tells Nott that now that his secrets are out, they can talk about whatever they want. Nott says that she doesn’t want him to worry about her. She says that she thinks he can get revenge and redemption for what he’s done. She explains that the good he’s done can counteract the bad from his past. He says that she’s getting ahead of herself, but they can talk if she wants. 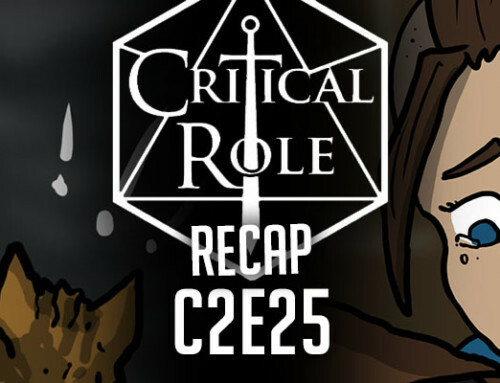 As they go back to their rooms, Beau and Jester gossip about the captain. Kiri begins to repeat what they say. Jester gives her the oral history of Tusk Love, but doesn’t make it quite so x-rated. Eventually, they all go to sleep. They adjust to unpleasant smell of the basement rooms of the tavern and drift off.